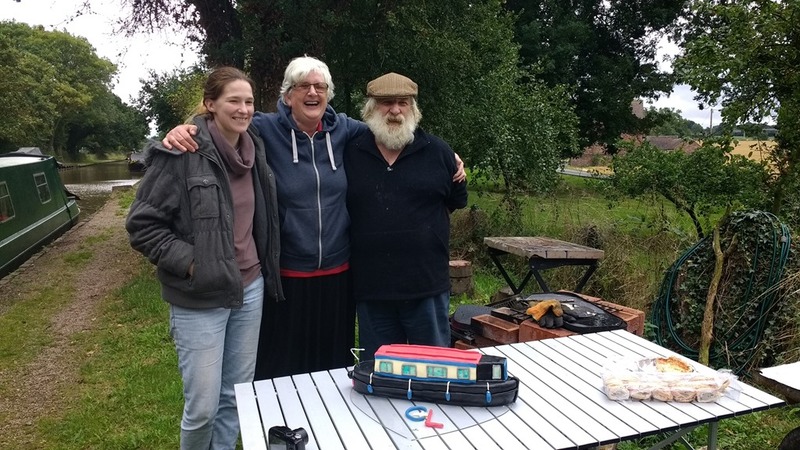 We spent a pleasant 10 days in Heyford, catching up with friends from the boatyard and from church and being invited out for meals on Paul & Rosemary’s boat, at Chris & Emily’s house and visiting The Barley Mow with Barry & Ruth. We managed to get some kind of internet using our O2 SIM card but it was slow and expensive £10 for 1GB then £20 to top up with another 5GB, if only I had been offered the 5GB preloaded SIM in the shop I would have made it last! On Thursday we took the train down to Oxford and visited the market where we surprised John who was manning his jewellery stall, Hasket Fasesik. 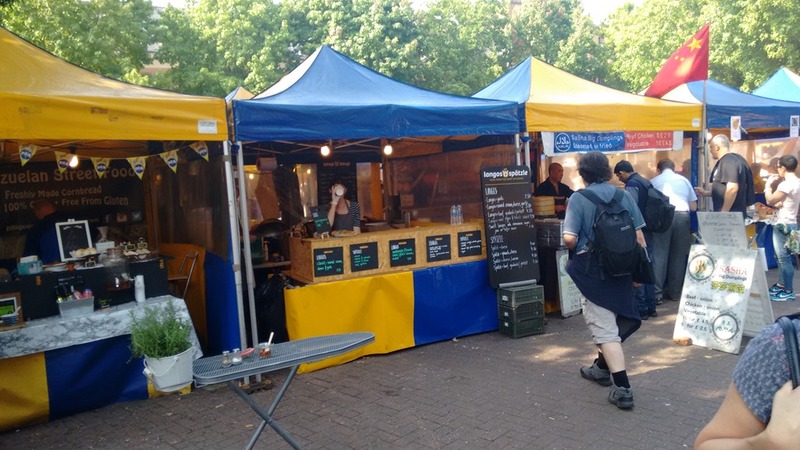 The market has a diverse range of food stalls too, so we had lunch there, me a Greek lamb kebab, cooked over charcoal and Joy a Lángos which is a Hungarian speciality, a deep fried flatbread topped with garlic, soured cream and cheese. 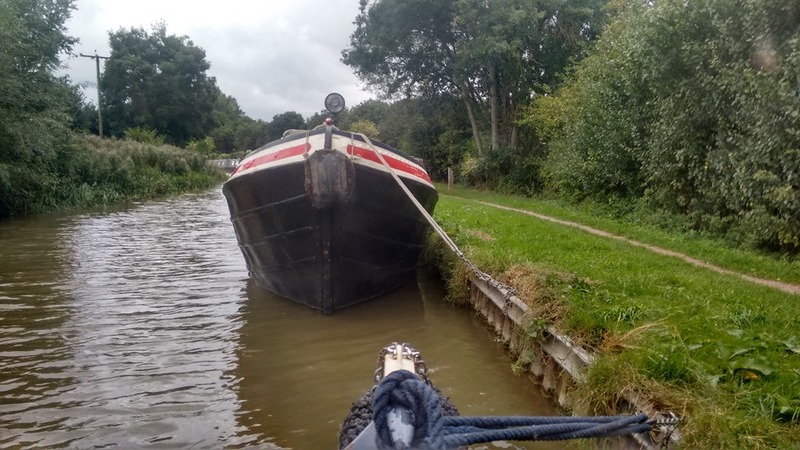 We moved down to the 48 hour moorings by the water-point for our last two nights and on Sunday (18th) we filled with water before turning around to start our journey back to Atherstone. Whilst filling up we had a chat with Bones who was out dog walking with Boots. 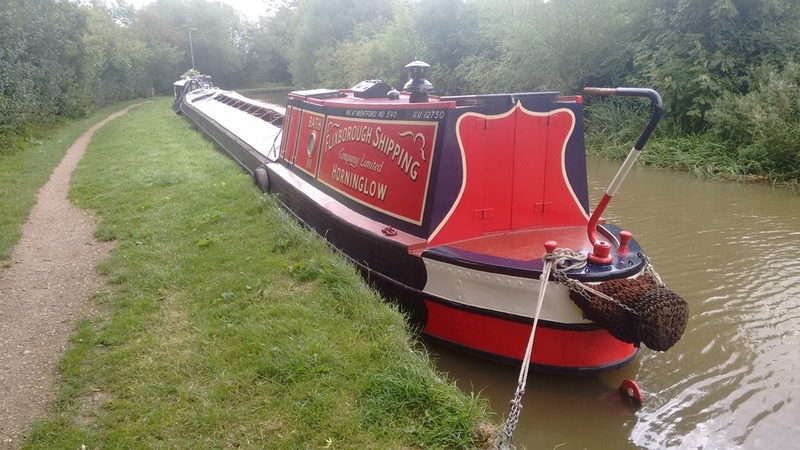 We had thought about stopping at Aynho again, but the weather forecast for Monday was rainy so we decided to push on to Banbury and were very glad we did, because in did indeed pour down on Monday just when Jane & Gordon were bringing nb Euphoria back to Banbury after being surveyed. We spent a couple of nights at Tramway moorings doing a few jobs, fitting a new fire grate and rear fire brick to our Morsø Squirrel stove. 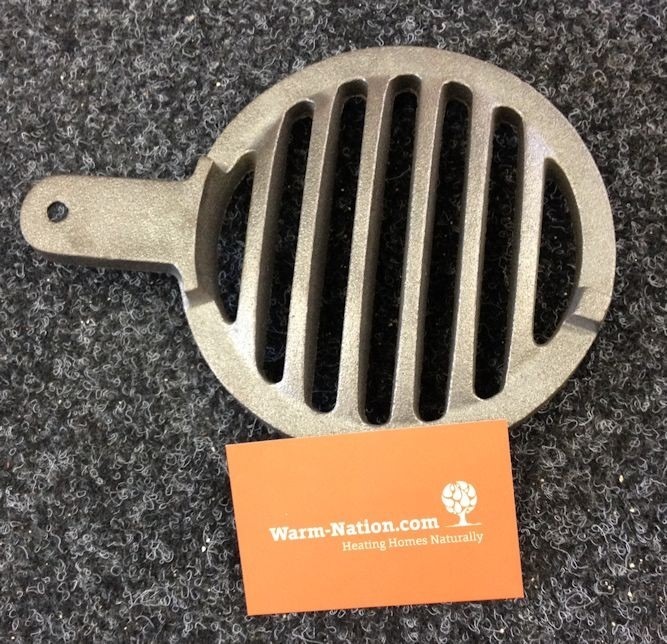 The grate was sourced from Warm-Nation.com who offer a ‘Best Price Promise’ & FREE delivery. I also managed to fix the 24v Klaxon horn from Jane & Gordon’s new boat nb Moon & Sixpence, and repair June’s starter motor, which needed new solenoid contacts. My good deeds for the day! On Thursday morning we moved up to the town centre & Joy was able to go to her art class at The Artery, after lunch with Sandra & Norma at the GF Club which we were moored right outside of. In the evening we met June there too to return her starter and we won a £5 voucher in the meat raffle. Yesterday we moved on to Fenny Compton through drizzle much of the way (it wasn’t forecast to appear until the afternoon) We shall stay here a couple of days and no doubt celebrate Joy’s birthday at The Wharf Inn. Just to finish, if you are in the Banbury area there are two opportunities to see a fantastic show at Tooley’s Boatyard on Friday Sept 30th (evening) and Saturday Oct 1st (afternoon). Kate Saffin & Heather Wastie of the Alarum Theatre Company are performing a double bill. A double bill to whisk you back to the days of WWII when a shortage of crews to keep the working boats going brought a new breed of boater to the canal – later nicknamed the Idle Women. Lose yourself in Isobel’s War (Kate Saffin) and Idle Women and Judies (Heather Wastie) and hear the stories of those young women who took on the challenge to manage a pair of boats and 55 tons of cargo. SPECIAL GROUP OFFER: Round up a few friends and take advantage of our special group offer. Five or more (and you collect the money from them) and the ticket price is just £8. Let us know via email or phone. We have spent a couple of enjoyable weeks in the Tramway area of Banbury near our old mooring catching up with our local friends. Almost everybody on the moorings seems to have caught the boat painting bug, which Joy is hoping I will catch too. We both had haircuts whilst in town, me at the barbers in Castle Quays and Joy at The Graduate Salon at the college. We shared a couple of evenings with Jill & John (nb Skylark) involving good food, drink, games and giggles, just possibly occasioned by the bottle of Ouzo which they had brought us back from their holiday! 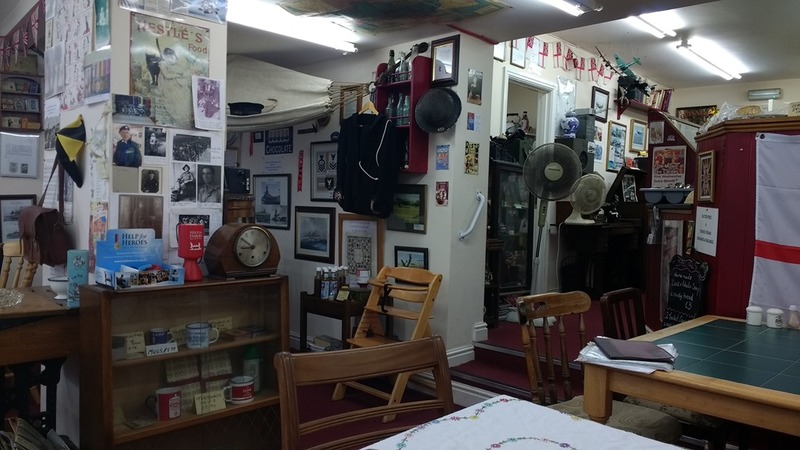 There was a trip back to Atherstone in the middle of our stay to help Linda and Cookie celebrate their wedding anniversary, but before joining them we had afternoon tea at The Larder a great little ‘40s themed cafe in Long Street Atherstone which we hadn’t discovered before. We had tried to hire a car for the Saturday but all the companies we tried, wanted us to have a 2 day weekend hire. In the end our friend June offered her car, as she was away for the weekend with her biker pals, so we were able to arrange a days temporary insurance for about £20. It also gave us the excuse to have a nice meal at The Jaypur Restaurant together to thank her before bidding farewell to Banbury again. On Wednesday morning I had an appointment at The Horton hospital for a eye check up (all OK) so after that I met Joy in Morrisons where she was meeting her friend Norma for lunch and after getting a few provisions for the trip we returned to the boat and set off for Aynho waving goodbye to friends once more. We arrived at Aynho Wharf just in time to get a pump-out before they closed and were fortunate to be able to moor opposite as a hire boat was just leaving. 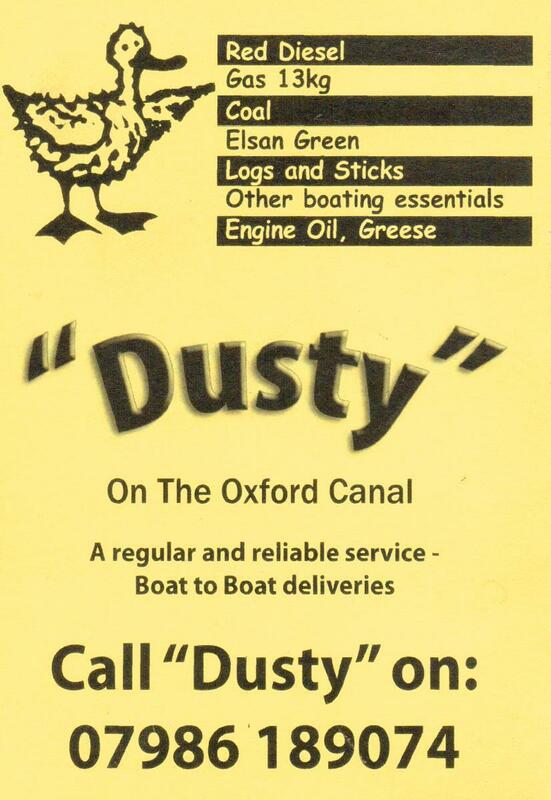 Later we got chatting to the crew of one of Oxfordshire Narrowboats fleet who were bemused that they had used a tankful of water since leaving Banbury that morning so I helped them shuffle their boat across to the water point opposite. It later transpired that four of them had had showers since filling up so if they weren’t used to being ‘careful’ with their water perhaps it wasn’t surprising they had run out. Thursday we made our way down to Heyford and found a spot opposite the church where we have moored many times before but never with a view of the bows of the ‘Big Woolwich’ Bath through our front window, dwarfing our modest craft! As boaters may know Lower Heyford is a renowned mobile phone blackspot so we were glad to be using the O2 network for our phones (via GiffGaff) as it’s the only viable provider in the area and also had the foresight to have purchased an O2 PAYG data SIM before leaving Banbury to temporarily replace our EE contract SIM.